I just burned ¼ million Skymiles & I just love it! I have just booked my 2014 summer trip to Sweden and burned up ¼ million Skymiles to do that since “saver” business seats now cost 125,000 each round trip so for Lisa & I together that adds up to 250,000 and you know, I am very happy with that. Why? I looked at the dates I will be flying and the price for the ticket in business class for the two of us would have run us $6749! That gives my redemption of my Skymiles 2.7 cents value for each. Now I would not personally pay this much for a ticket, but it still shows the value I am getting. I ran the numbers and even a coach ticket would have set me back $2944 if I were to buy it. All I had to pay was my points plus tax. I have not seen London yet. Paris, Amsterdam & others yes but London no. 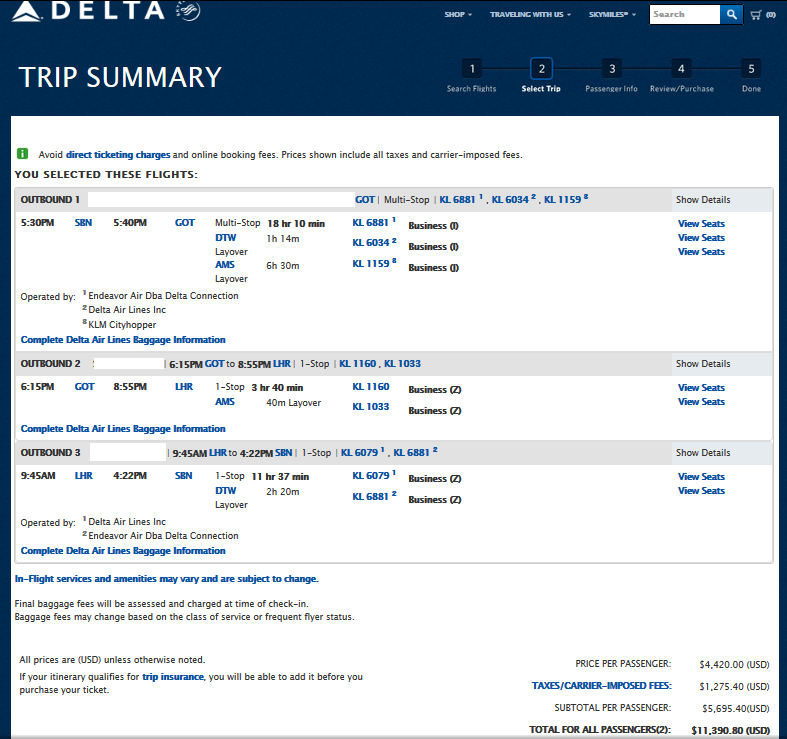 So, thanks to the stopover rules with award tickets on a Delta award ticket I am going to do just that on my return. It will all be in business class and if I had gone ahead and purchased such an itinerary, well, you can see what Delta.com says it would cost me above – yikes! I do also have the luxury as a Diamond Medallion to make any changes I want free of charge up to 72 hrs before the flight and may tinker with flights as I can try to squeeze a free day in Amsterdam if I can keep it less than 24hrs between my connections (Delta allows only less than 4 hrs on a domestic but less than 24 on international awards). PS – Don’t forget about SWAG Saturday at 1:PM – $50 Gift Card on-tap! You are correct insofar as a “skypeso” has some value greater than nill. However, having some value greater than zero does not qualify a medallion mile as “hard” currency. Particularly compared to the earn and burn rates on AA, US, AS or UA. The draconian 72hr change rules on awards add further insult to injury. Comparing it a paid ticket for value which will never be realized does not give Skymiles a 2.7c value. (True for other carriers too) Add in the additional miles required, lack of saver availability over competitors, and unfriendly terms like 72 hr change policy, skymiles is still the least likely option when one has options. If you have your stopover in London on the way there, instead of return, you’ll save hundreds of dollars. How much were the taxes on these tickets? @tj – worth it to me on right time zone. 200 extra return. Good work, Rene! Yes, why are the taxes so high coming out of London? I’m looking at a RT to LHR and it’s $2.50 into London, $400 out of London. Wow! You’ve gone from being outraged at each Delta enhancement to being a cheerleader, whether it’s MQDs or the devaluation. You can’t tell me with a straight face that you’re getting more value redeeming at 125k in June vs 100k in May. @dbest – no no it stinks big time but if this rate sticks 5-10 yrs am OK with it. Good stuff, Rene! Nice to see miles put to good use…enjoy UK and Amsterdam, two of my frequently travelled airports (I always do the night-before-leaving at LHR T4 Hilton to make for quick Delta getaway next morning and also to get my 500 Delta points from Hilton Honors! Watch out on your flights though, because a disturbing new trend possible: the DL39 flight I literally just walked out of (am typing this at ATL Gate A17 lounge real-time) had a test of a new in flight service for Elite Business Class and it involves the FAs using aisle carts similar to the econ class model. It was inconvenient for overhead bin access and also access to restrooms during food/bev service. Plus this new service model does not give you a real cloth napkin until the main course, so for the salmon appetizer (which was tasty) I had to be extra careful of my business dress shirt. I am probably one of the few on your site who actually pay the full business class fare (company travel) and for that kind of money I don’t care for the aisle cart service. I have already fed constructive and professional feedback to Delta online, but perhaps others shoudl be equally vocal in feedback or I fear our upgraded business class service may be gone forever!! The real question for determining what value you got, is how much you would have been willing and able to pay in cash for the trip? SM aren’t totally without value, and as with any program there are sweet spots, and dead spots. But I think you’re way overselling the SM concept here. Less experienced folks need to realize other factors (routes, airlines, time of purchase, lost miles earning opportunity in a program with more value, etc) are important and are places where DL falls well short in many scenarios. There is no way the current BE TATL mileage price lasts anywhere close to 5-10 years! You’ll be lucky if it doesn’t devalue again within 12-18 months…maybe 24 months at the outside. Part of the flight is on Alaska Airlines. How do I confirm our seats? Would I do it via Alaska’s website? Skymiles definitely have their uses. I am excited for my business class flight to Australia coming up in January that I got at the low level. Granted, I booked it back in March prospectively. Skymiles are definitely very easy to earn. That said, no matter how much you want to talk about how great they are, for most readers that is just not the case. They can be used, but it takes a ton more time and effort to use them than other currencies. Time is money, so Delta costs more. Assuming you aren’t Diamond or perhaps even Platinum, it is even worse. Add all of that what seems to be discord between the Skyteam partners and you just have an inferior currency by just about any possible measure. And some people earn miles with the specific intent to fly international First, which is not possible with Skymiles. I don’t need to fly 1st, but it’s a nice option to have available too. While I enjoy reading the blog and have amassed some “SkyPesos” of my own, the redemption rate you were excited about seems incredibly low. On a recent search I found business class ORD to HKG on American for 110,000 points. The average fare was floating around $4,000, this gives you a value of 3.6-4.0 CPM depending on whether or not you hold the AA credit card. 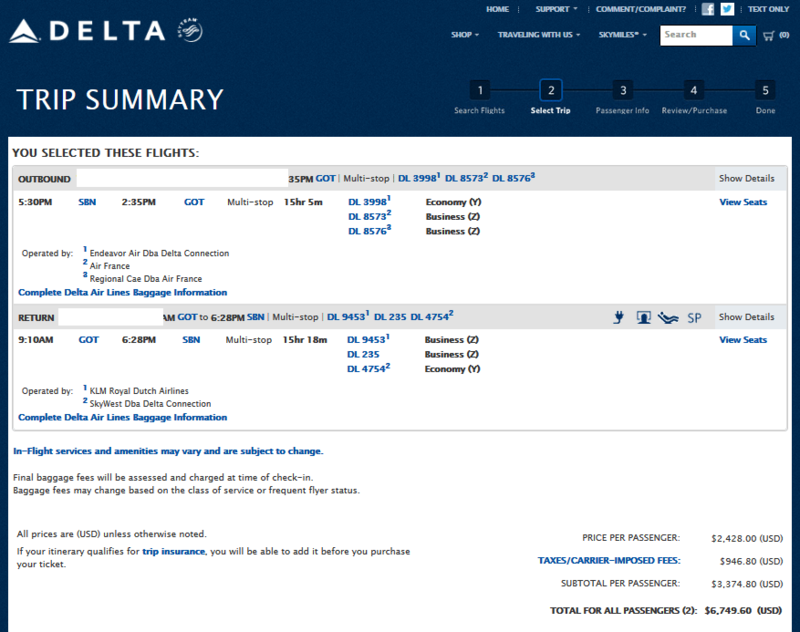 First class was just shy of $6700, which only requires another 25k miles on AA (4.9-5.6 CPM). That’s about twice the value you found for the same amount of miles, and likely the same cost of acquisition. I also looked at US Airways to give a star alliance approach. It’s a comparable value to HKG (4.4 in business, 5.58 CPM for international first). There are plenty of other examples, but I don’t want to belabor the point. When a traveler accumulates miles via credit cards for example, after the initial sign up bonus, normal spending is 1 mile to $1. In coach all these airlines earn equally. This means that there is no lower cost to acquisition of the miles but the redemption chart like Delta’s that is so inflated, returns a lot less for your money. On your specific example, the same ticket would cost on American (90-100k miles or 6.7-7.4 CPM) and the same on US Airways. So with a rate of 2.7 compared with 6.7 at minimum, how can you argue AGAINST the term “Skypesos”? @Kyle – they are well worth it when you can do the work to get the good “saver” low level seats.